There are times when newer is not necessarily better. 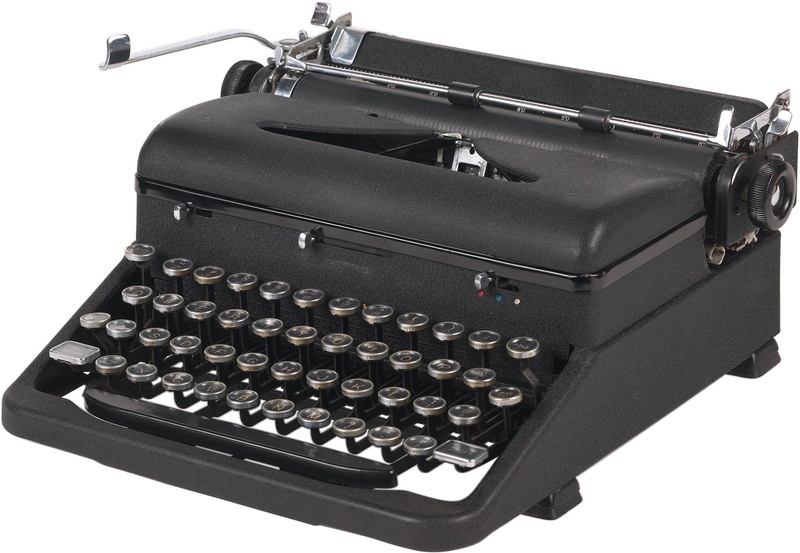 Call me a dinosaur, but I have been looking around at manual typewriters. But why, you may ask. Anyone who knows me well knows that I write first drafts in longhand. It doesn’t matter if it’s a poem, a short story, an essay, or a novel. A couple of decades ago, I finished a novel on a typewriter. But I started it longhand. Over the years I have tried various computers and their word processing programs. And all them did me well. Still, for me, there’s nothing like composing a draft with nothing but a legal pad (college-ruled, of course) and a pen. And, as of late, I am wanting for a typewriter to type up intermediate drafts of those hand-written drafts. Ludicrous you say? Perhaps, but maybe this isn’t about using nearly obsolete technology (the typewriter…not pen and paper…pen and paper will always be around…heck, I can stir up a five-subject notebook in which draft of a novel was written, part of it in pencil…it was a particularly snowy night and my favorite pen had run out of ink…). Maybe it’s about something else. Let me take you back in time. To say my father was a hoarder would be untrue. He did, however, collect things from time to time. In warmer weather, it was egg shells and coffee grounds to fertilize the lawn. One day he brought home a manual typewriter from work. I was in the sixth grade. Or maybe it was end of my fifth grade year. My family moved out of the Fairview section of Camden, NJ in May 1977 and went out to the suburbs (Runnemede…Exit 3 for Jersey natives everywhere). Back then there were perhaps two things in the world that interested me most. One, comic books. I was a Marvel Comics guy. The Incredible Hulk, Iron Man, Prince Namor, and others. Doctor Strange was too out there for me, but not for long. Later, by the eighth grade, weed would take care of that. But I digress…The second thing? Science fiction and fantasy novels. So it was no stretch that between comic books and sci-fi/fantasy novels, and the manual typewriter, I thought I would make up my own story. There was a comic book I bought called Man-God (Marvel Comics). The story was about a guy who had, you guessed it, god-like qualities. His name was Hugo Danner. You can read more about Man-God here, but do come back. There’s more. Near the typewriter there was a pocket dictionary with a red plastic cover. It may have belonged to my brother. It may have belonged to one of my sisters. I mention this because I took perfect sheets of typing paper, traced the outline of the little red dictionary on the top page, and proceeded to cut them down to size. Afterward, my mother extolled the virtue of not being wasteful. For her, all things paper were expensive. Obviously, typing paper was expensive, as were loose leaf, napkins, paper towels, and the ever-present supply of brown paper lunch bags in our home (I went through a spell in the second grade making puppets out of brown paper lunch bags…and then throwing them away). My mother would turn out to be a formidable foe in my homemade book project. For a week, I petitioned my parents to let me tear the little dictionary out of its cover and then use the cover for my little story. “You shouldn’t destroy books, Richard,” my mother had told me. “You will get it all over,” my mother concluded. In our house there were few different dictionaries. Paperback ones we carted to school. The aforementioned Little Red Dictionary. And the coveted “good dictionary” which was a two-volume hardbound Merriam-Webster set my father had inherited from his father. “What do you want to do with the little dictionary?” my father asked. “I want to use the cover for my book,” I told him. “Ask your brother and sisters,” he replied. While the jury was still out, I went to work composing my little story which, as I recall, was inspired by, if not a complete rip-off of, Man-God. As an eleven-year-old boy, I had no idea how hard typing could be. It didn’t take long to find out. Sadly, I no longer have that old story in my possession. If I had, you can bet I would post it here. In truth, I was reluctant to embrace computer technology when it came along. In time, however, I learned to use it and rather well. Nevertheless, I still yearn for those days at my parents’ kitchen table, or out on the back porch where my mother kept a small table or another and a couple of chairs over the years (primarily, as a smoking lounge of sorts), when I would sit at the typewriter, pound out a few pages, and dream of other worlds. I still dream of other worlds, of course. That much will never change. Call me crazy, but there is something to be said about the noise of good old-fashioned typewriter; to say nothing of the imperfect print and smudge that comes with honest writing. The clatter will never bring back those days from when I was young; no more than it can bring back my parents. Maybe it will rattle some memories, and I will write an honest work about the two people in my life who encouraged this writing thing. And if not, I can sure try and make some noise.